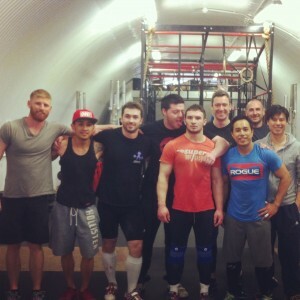 Bethnal Green lifters- Joe, Alex and Calum- join my CrossFit Evolving students for a pre-British Championship session. Great atmosphere, some serious weights shifted, a ‘valiant’ effort at a muscle-up from Joe and an unfortunate tug of war for the BGers even with my help (or because of it?). Good luck at the British to Seth, Joe, Alex and Calum!